With its boundless energy to search for nectar, the hummingbird reminds us to seek out the good in life each and every day. 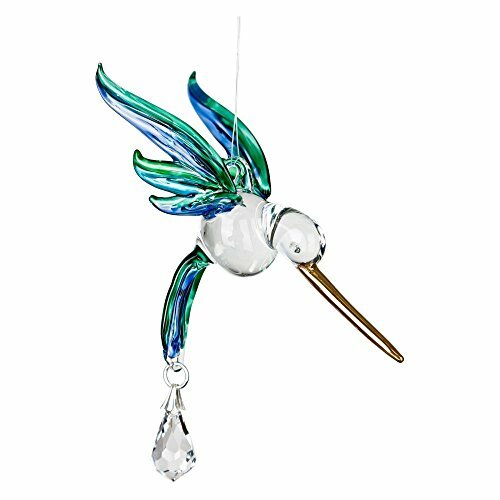 Hand-painted in the bright colors of summer, this hand-blown glass hummingbird tops a genuine Austrian crystal that sparkles and shines in the sun. Packaged in an attractive gift box. Recommended for indoor use. Woodstock Crystal Sun catchers - they do for light what our chimes do for sound. More than 30-years ago, the first Woodstock Chime was created by founder and owner Garry Kvistad from an aluminum lawn chair he found in a landfill. As a professional musician and instrument designer, he was fascinated by the Scales of Olympos, a 7th century pentatonic scale that can't be played on a modern piano. Garry had the idea to cut and tune the lawn chair chime tubes to the exact frequency of the ancient scale. The resulting Chimes of Olympos was the first Woodstock Chime and is still one of our bestselling wind chimes. Garry and his wife Diane founded Woodstock Percussion, Inc. in 1979 and it remains a family-owned business in New York's Hudson Valley. Overall dimensions: 4 inches long x 6 inches overall with hanging line. Includes one glass suncatcher hummingbird. If you have any questions about this product by Woodstock Chimes, contact us by completing and submitting the form below. If you are looking for a specif part number, please include it with your message. HF-175 Vintage Tiffany Style Stained Glass Church Art Flowers Rectangle Window Hanging Glass Panel Suncatcher, 26.5"x20"
HF-176 Rural Vintage Tiffany Style Stained Glass Church Art Sweet Flowers Rectangle Window Hanging Glass Panel Suncatcher, 26.5"x20"